Is the rear extension at 124 First Place legal under the new Carroll Gardens Narrow Street / Wide Street Zoning Text Amendment? As background info, the extension on 122 First Place was legal under the former wide-street rules in the NYC Zoning Text, and 126 First Place received a variance to continue their renovation under the old wide-street ruling, after the new Carroll Gardens Narrow Street/Wide Street Zoning Text Amendment rules went into affect. I was on my roof today and noticed that 124 First Place was building a rear extension. I assume that they are balconies, but to my untrained eye, the structure looks more like a room addition than balconies? The balconies on 126 First Place (taller building in the background) are more what I would call a balcony - but I am no engineer or architect - so am looking for an expert's opinion to see if this is legal under the new text amendment regulation. 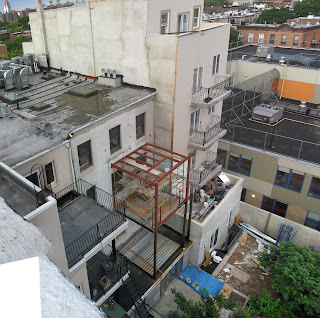 I also realize that it is hard to cantilever a balcony on to an old brownstone building, and that an outside structure may have been needed, but I have a problem with this, because a condo owner could easily fill in these structures, thus making an ad hoc rear building extension. Furthermore this structure is massive, and it goes out into the rear yard as far as what was formerly permitted under the old wide-street zoning regulations!